Our second project, which commenced in July 2017, is researching the treatment and improved detection of osteosarcoma – a rare type of bone cancer that most commonly affects children and young people. There is an urgent requirement to develop novel therapies that target metastatic osteosarcoma. In addition, better detection is pivotal to improving outcomes for children and young people with this form of cancer. If successful, the data obtained during this research could help to greatly improve the detection and treatment of patients with osteosarcoma in the future. Below is a project update from lead Friends of Rosie-funded researcher, Dr. Katherine Finegan at The University of Manchester. Osteosarcoma is a rare type of bone cancer that usually develops in growing bones. It’s therefore most common in children and adolescents. Surgery and chemotherapy are effective treatments for those patients whose cancer hasn’t yet spread. However, if the osteosarcoma spreads to other parts of the body, called metastasising, fewer than 30% of patients survive five years after diagnosis, a survival rate that has remained virtually unaltered over the last 30 years. Through this project we are researching the role of a protein called, ERK5, which is believed to advance the spread of tumours. The project will aim to validate the use of ERK5 inhibitors in the treatment of the metastatic spread of osteosarcoma, whilst simultaneously developing novel molecular-imaging based methods to detect the progression of the disease. 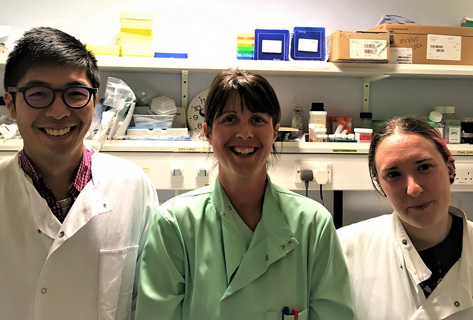 The research team have also been developing some novel inhibitors (as part of another project), which we have discovered affect the growth and spread of osteosarcoma cells. The remaining 9 months of this project will involve further imaging experiments on our osteosarcoma models and targeting of a pathway that we think will prevent the spread of osteosarcoma in our models and as a result would become the basis of a future treatment for osteosarcoma patients. The research team for this project includes Dr. Katherine Finegan, Heather Eyre (research technician), and Jason Chu (PhD student).